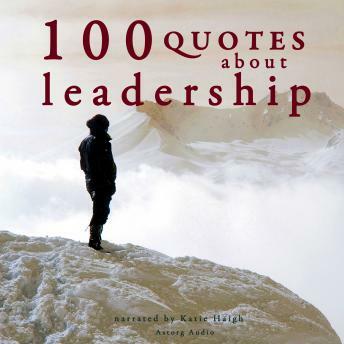 We have selected for you 100 great quotes to develop your leadership. Leadership is a practical skill, regarding the ability of an individual or organization to "lead" or guide other individuals, teams, or entire organizations. Having a great sense of leadership can inspire great men and women in their actions, in their thoughts, in their lives, and in the lives of many people around them. Leadership is also defined as a process of social influence in which a person can enlist the aid and support of others in the accomplishment of a common task. Those 100 great quotes will inspire you, will motivate you, will give you thoughts, ideas, will help you to develop your thinking and your ability about leadership. Listen to it, it will help you to change. A great quote is very similar to a great thinking and a small poem. It can encapsulate a large web of ideas, thoughts, reflections, emotions in a few words. The reader of a great quote is forced to think about what he just heard. He has to think about those words and what they mean. An excellent quote requires the reader to pause to contemplate the real meaning and poetry of a few words. A great thought reaches a level of universality. Quotes hit hard into the essence of being human. The right quote can help us to see some invisible meanings of things or subjects. The range of authors of those 100 quotes to develop your leadership is very wide: from Sun Tzu to Steve Jobs, from Dwight D. Eisenhower, of course, to Napol?n Bonaparte, Henry David Thoreau, Colin Powell, Nelson Mandela, from Homer to the Holy Bible or Carl von Clausewitz.